Throughout the holiday's history, Christmas has been the subject of both controversy and criticism from a wide variety of different sources. The first documented Christmas controversy was Christian-led, and began during the English Interregnum, when England was ruled by a Puritan Parliament. Puritans (including those who fled to America) sought to remove the remaining pagan elements of Christmas. During this period, the English Parliament banned the celebration of Christmas entirely, considering it "a popish festival with no biblical justification", and a time of wasteful and immoral behavior. Controversy and criticism continues in the present-day, where some Christian and non-Christians have claimed that an affront to Christmas (dubbed a "war on Christmas" by some) is ongoing. In the United States there has been a tendency to replace the greeting Merry Christmas with Happy Holidays. Groups such as the American Civil Liberties Union have initiated court cases to bar the display of images and other material referring to Christmas from public property, including schools. Such groups argue that government-funded displays of Christmas imagery and traditions violate the First Amendment to the United States Constitution, which prohibits the establishment by Congress of a national religion. 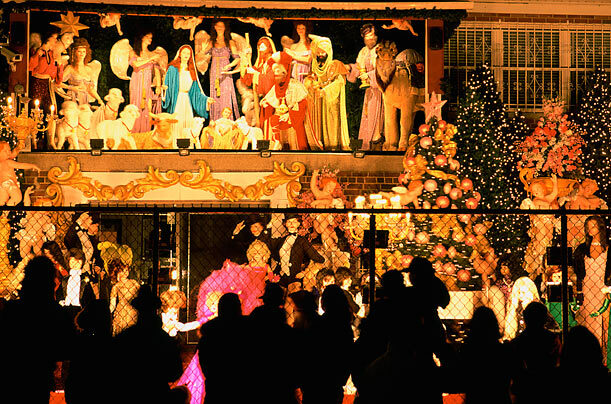 In 1984, the U.S. Supreme Court ruled in Lynch vs. Donnelly that a Christmas display (which included a Nativity scene) owned and displayed by the city of Pawtucket, Rhode Island did not violate the First Amendment. In November 2009, the Federal appeals court in Philadelphia endorsed a school district's ban on the singing of Christmas carols. In the private sphere also, it has been alleged that any specific mention of the term "Christmas" or its religious aspects was being increasingly censored, avoided, or discouraged by a number of advertisers and retailers. In response, the American Family Association and other groups have organized boycotts of individual retailers. In the United Kingdom there have also been some controversies, one of the most famous being the temporary promotion of the Christmas period as Winterval by Birmingham City Council in 1998. There were also protests in November 2009 when the city of Dundee promoted its celebrations as the Winter Night Light festival, initially with no specific Christmas references. Happy Holidays and Enjoy the Year End! ← Mirror, mirror on the Wall… Who is the Ugliest of Them All?